Please join us on February 17th! Our keynote speaker is Alex Meluskey, candidate for U.S. Senate. 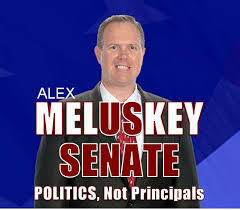 According to Meluskey’s campaign website, he is running because as a citizen he is gravely concerned with the lack of direction, lack of principles and lack of citizen representation in our country. Alex states that he is in a unique position to shift his business interests into the hands of others so that he can focus his energies on giving others like himself a voice he feels the people do not have. Alex sees too few leaders in Washington standing up for the people. The people deserve leaders who will be direct with where they stand on issues and what they plan to do. After that, the leaders must be accountable to their promises. Alex will be direct, honest and accountable to the people for his promises. For more information please visit http://www.meluskey.com/. Also speaking in February is Chuck Schmidt, a member of the Arizona State Board of Education, having been appointed by Governor Ducey in January 2015. Mr. Schmidt is representing Yes on Prop 123 which will be coming up for a vote in our state on May 17th. This is Governor Ducey’s education plan to allow additional and sustainable funding that our schools currently do not have. The plan increases base per-pupil funding to $3,600 a year; provides $3.5 billion in additional education funding over 10 years WITHOUT raising taxes; establishes certainty for much-needed K-12 funding by infusing the education system with funds from the State Land Trust and protects the state’s general fund in times of economic downturn. For more information please visit http://yesprop123.com/. Note: Palo Verde RW likes to bring to our members both sides of the issue. The opposing view to Prop 123 will be presented at our April meeting by Arizona State Treasurer Jeff DeWit. The cost of the luncheon is $27 if paying by credit card. Pay with cash or by check and the cost is $26. To make a reservation for our luncheon, contact Sherry Gray by email: pvrwlunch111@yahoo.com.